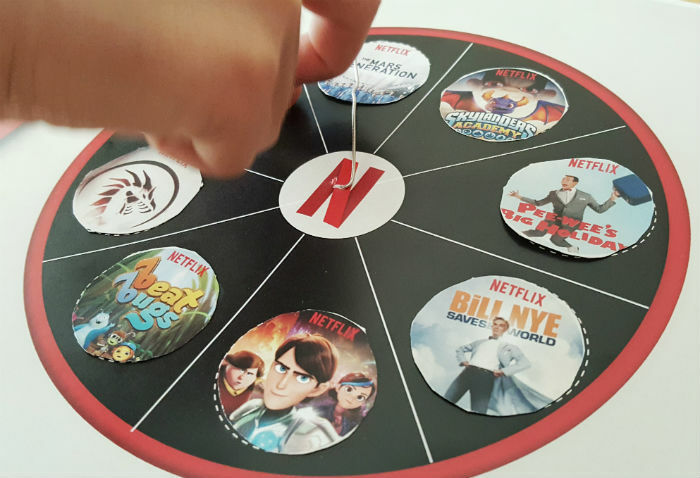 In this post, we show you how to make a Netflix roulette wheel to finally end family squabbles over what to watch on Netflix. If your kids are anything like mine, they argue about what to watch on TV. Honestly, sometimes I feel that 80% of parenting is trying to get my kids to agree on a show on Netflix. Luckily, Netflix must have been reading my mind when they created the Netflix spinner. 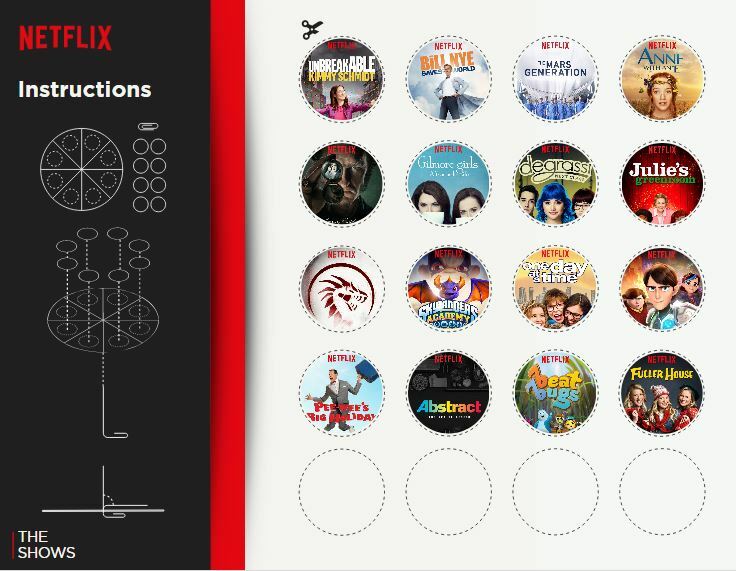 It’s a Netflix spin wheel that takes the arguments out of what show to watch. Long gone are the days when we had no choice over our TV programming, and we had to watch according to network schedules. There’s are so many great kids’ TV shows out there that there’s almost an endless selection! Today, we have the freedom to choose to watch what we want, when we want. The only problem we have now is that we don’t always agree on what to watch as a family. 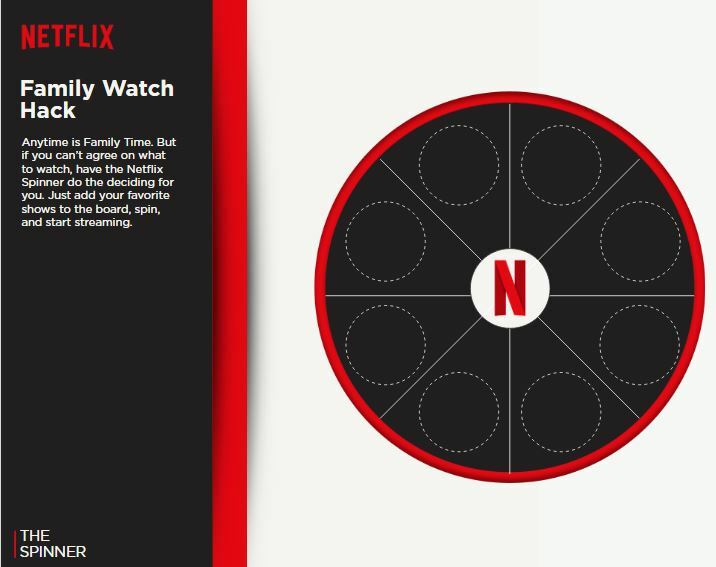 Luckily, Netflix has created this fun little Stream Team spinner to solve sibling rivalry over the remote. When I showed the Stream Team spinner to my eight year old, she wanted to make it right away! It’s pretty simple to make. I am not the most crafty person in the world (massive understatement there), but with my little girl’s assistance we managed to make a great spinner. 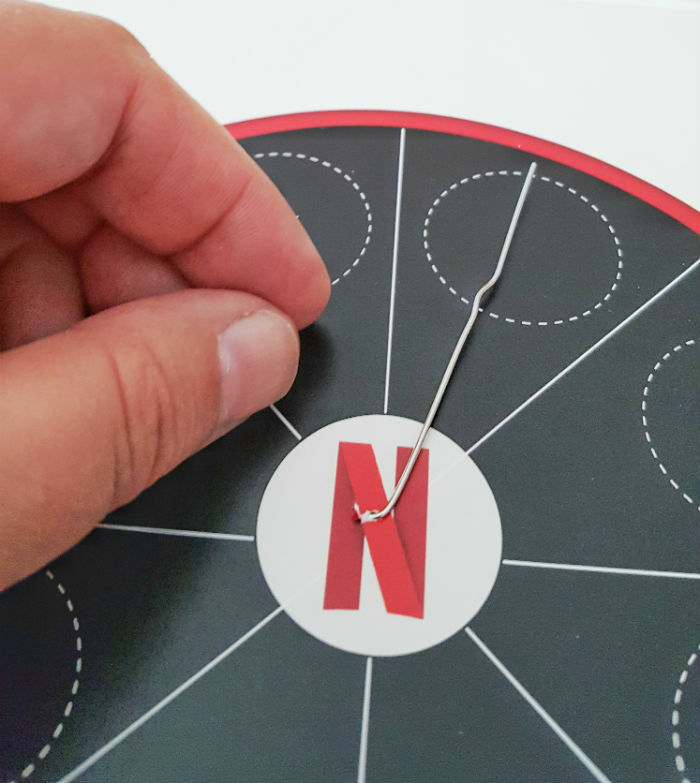 Really, all you have to do is print out the sheets, cut out and add add your favorite shows to the board, add the paperclip dial, spin, and start streaming. 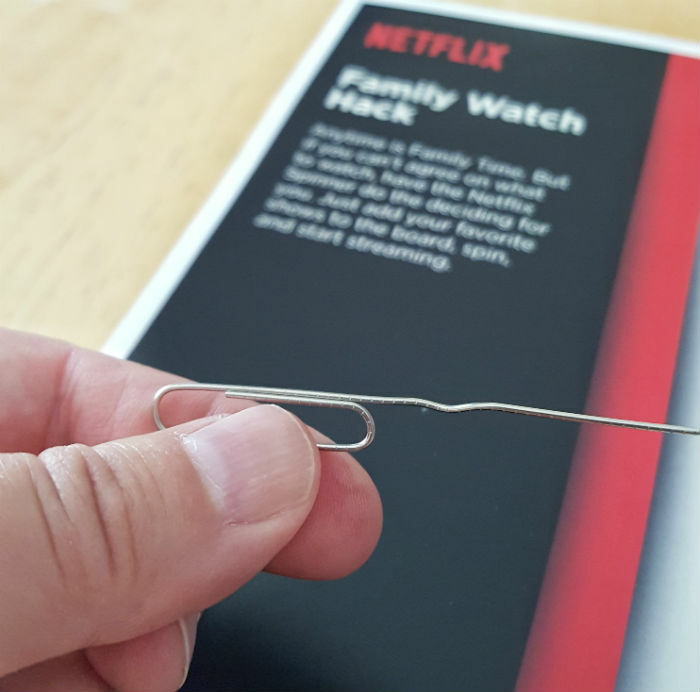 The Netflix spinner. You can download the spinner here. It’s two pieces of paper. 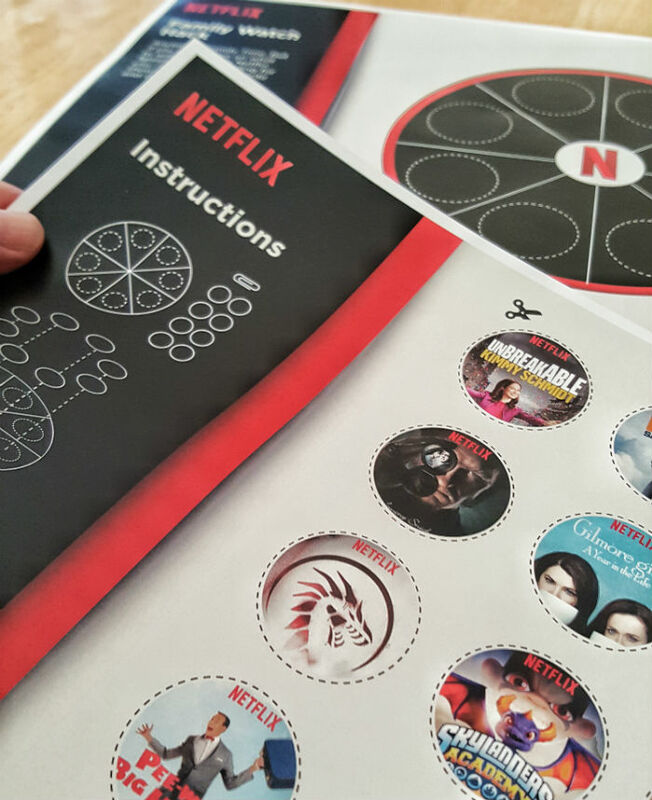 First, print out the two sheets of the Netflix spinner. We really loved printing it out in color, but it would work perfectly well if all you had was a black and white printer. Tip! Insert the paper clip spinner before gluing the shows to the background. 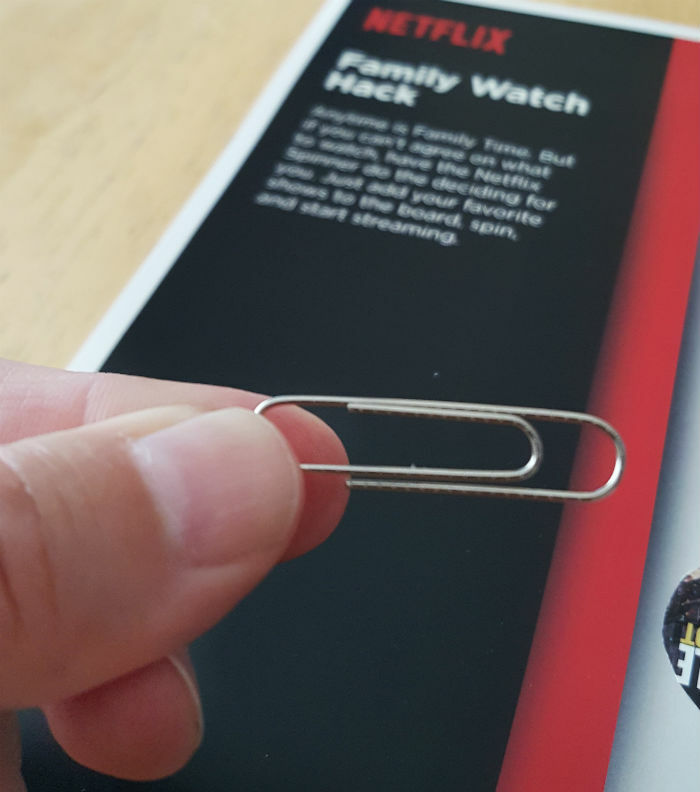 If you glue the shows to the spinner background before you put in the paper clip spinner, it’s hard to insert the spinner without knocking the show labels off. First, get the paper clip spinner dial ready. To do this, you’ll need to unfold the paper clip, poke it through the back of the dial, and fold the spinner dial down again. Just follow the pictures – it’s easy. First, pick up the paper clip. Then unfold the longest section. 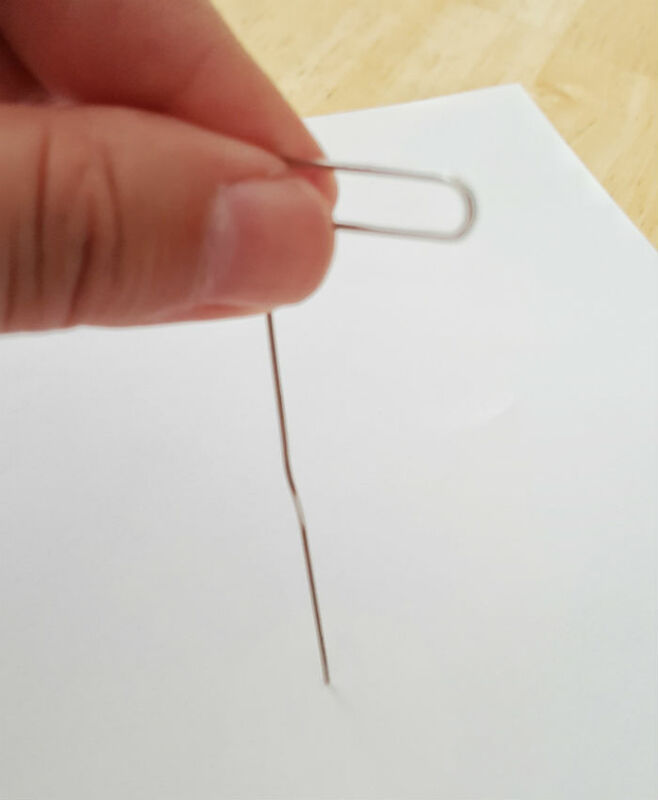 Tip: you could use needle nose pliers to gently straighten the bend in the paper clip. Next, point the long wire straight up. Now, you’re ready to poke the end of the long wire into the back of the spinner. Turn the spinner over, so you can only see the back. 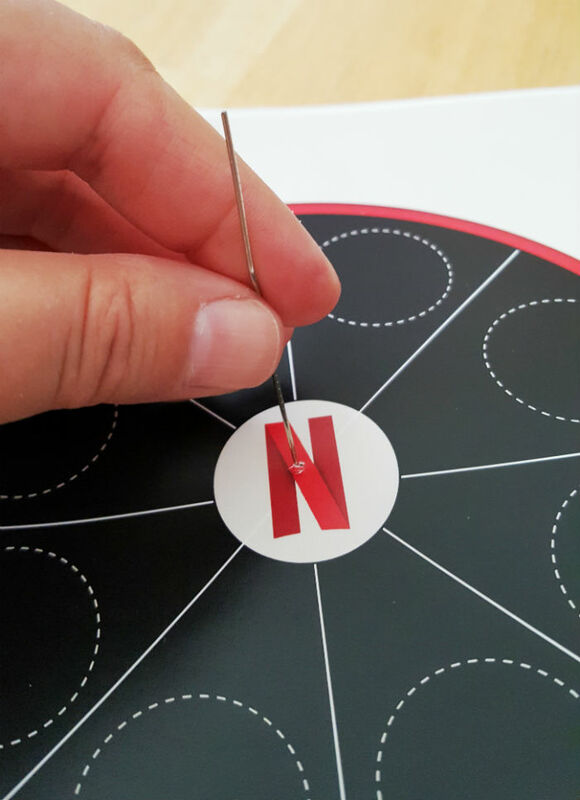 Then, line up the tip of the wire with the middle of the spinner (it should be on the N in the middle), and push it through. Voila! Now the wire is through. All you need to do is to fold the paper clip wire down, and your spinner is ready. 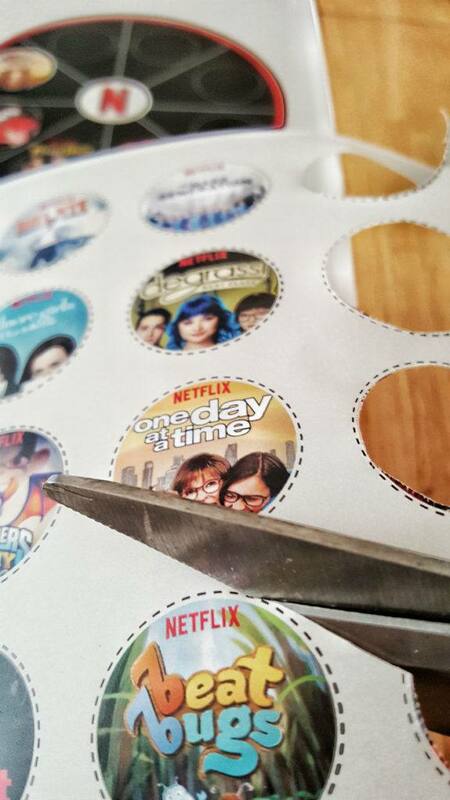 Now, you’re going to cut out your favorite shows, and then glue them to the spinner. My little girl was a pro at the gluing part, while I did the cutting. Let the spinner sit for five minutes to let the glue dry. 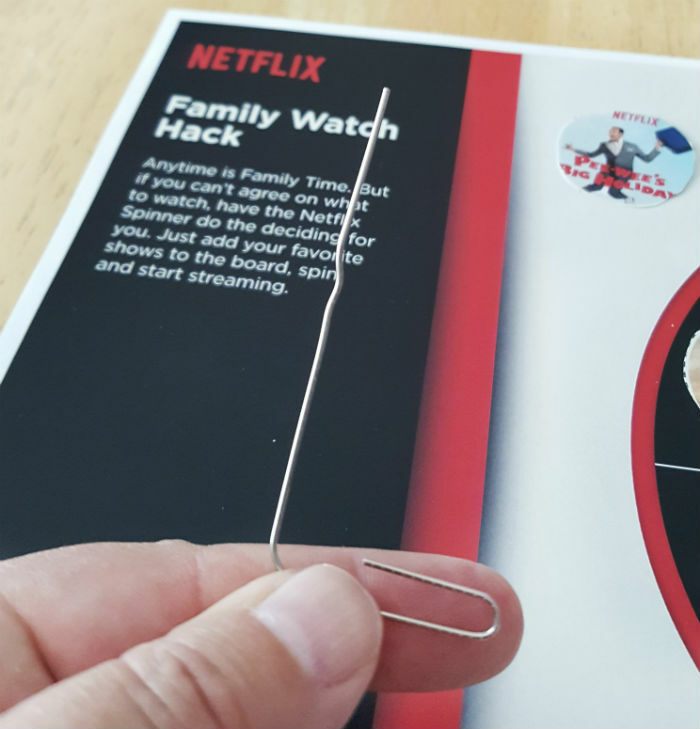 To use, just spin the paper clip, and let the spinner decide what you should watch! Wait a minute… did I see one for Degrassi? I used to watch that when I was in junior high!! My kids watch a lot of tv on Netflix and we are notorious for binge watching. That looks awesome. I often find myself trying to find a fair way to solve TV arguments. This is great! That is such a cute and clever idea! I think I should make one for me and my husband! Like yes, please. I need this just to decide which show I want to watch first. What a brilliant idea. This is so clever! We definitely had TV squabbles (and everything else squabbles) when the kids were little. Now it’s just my hubs and I negotiating over what to watch! This is a really cute idea. There’s no arguing with the results of the spinner. 😉 I like that there are blanks so other shows can be added in as options. Lol. That’s a good way to settle a dispute. Especially when everyone has a preference of what they want to watch. Good idea. This is a super fun idea! We need it at our house!